50G PCS/KP4 FEC and MAC IP Cores – Precise-ITC – ASIC / FPGA Innovation! Canada Technology Innovation – ASIC, FPGA & Embedded Software ! 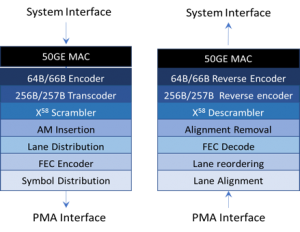 The fully integrated Physical Coding Sublayer (PCS) and Media Access Controller (MAC) core for 50Gbps Ethernet applications are compliant with IEEE 802.3cd draft standard. The interface to the PMA supports either 2x 25Gbps or a single 50Gbps bi-directional, serial interface. The PCS sublayer includes encoding, transcoding, scrambling, FEC layer, and symbol distribution. The north-bound interface from the MAC provides a configurable n x 64-bit system interface. The southbound interface performs the mapping of transmitting and receiving data streams (at the PMA layer) to the on-chip SERDES. This core is responsible for channel alignment and KP4 FEC management. The PCS supports an interface for 50GBASE-CR or 50GBASE-KR. Super low latency with minimized fixed and variable delay for network efficiency. Alignment Marker (AM) insertion. Unique marker portion of AM for each lane is s/w configurable. All Precise-ITC cores have been tested on both Intel/Altera and Xilinx FPGA hardware. Precise-ITC partners with leading test equipment vendors like Spirent and Viavi to prove interoperability. SOC cores have been implemented with ASIC/FPGA partners using the latest technology nodes. Precise-ITC cores are designed for efficiency. Built-in data buffers are efficiently implemented to reduce overall delay through the data path. Variable delay (or jitter) is tightly managed to ensure 1588v2 time-stamp accuracy. Precise-ITC can provide simulation models and routable RTL along with detailed interface documentation. Contact Precise-ITC for more information.